Progress Map add-on will add the “Progress Map” submenu under the GamiPress menu. Accessing to this menu you will be able to start configuring progress maps similar to WordPress post/pages views. 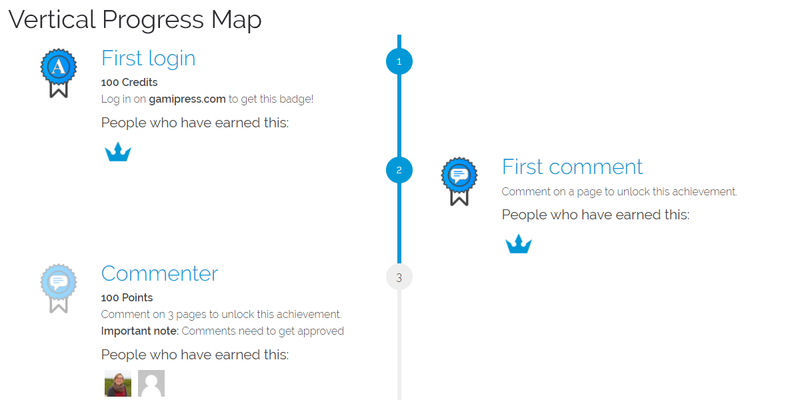 First you will need to configure the items (achievements or ranks) to place in the progress map. Note: For Specific achievements and ranks, you can set the order which achievements will be displayed by dragging them. Note 2: For All achievements and ranks of a specific type, you will be able to set which achievement type or rank type will be items loaded from. The order of this items will be calculated automatically by the date of creation of the achievement and rank and add-on will place at first position achievements and ranks that user has been already earned. Checking this option will hide the text of the upcoming items that the user has not been unlocked yet. Note: For achievements, a trick to keep always the relative order is set the previous achievement as requirement of the current one, something like to complete the 3rd achievement first user needs to complete the 2nd one. 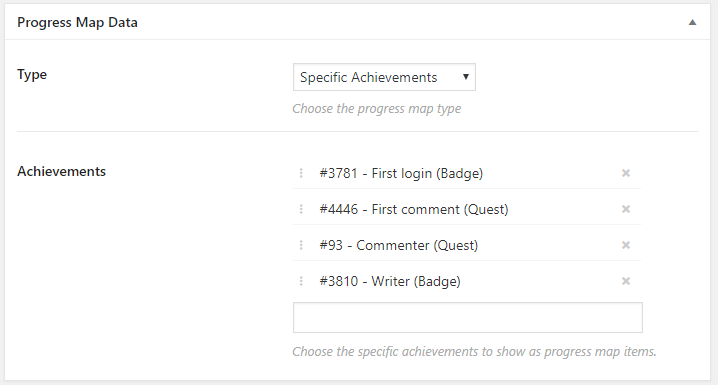 Inside the Progress Map Display Options box you will be able to configure how achievements or ranks (depending of the type you set before) will look with controls similar as you can found on the achievement and rank shortcodes or widgets. 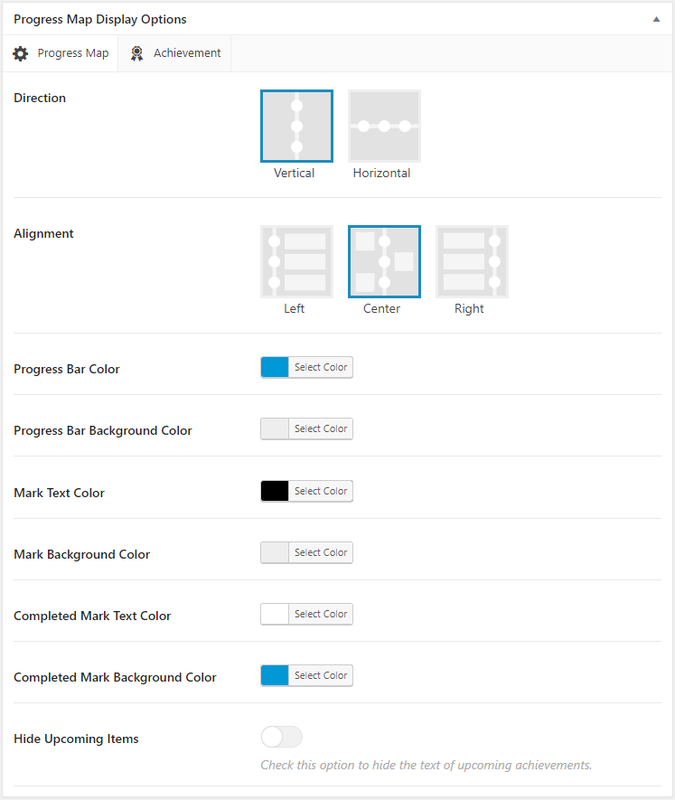 Also, on this display options will appear options added by other add-ons like “Show discounts” option added by the WooCommerce Discounts add-on or “Show progress” option added by the Progress add-on. 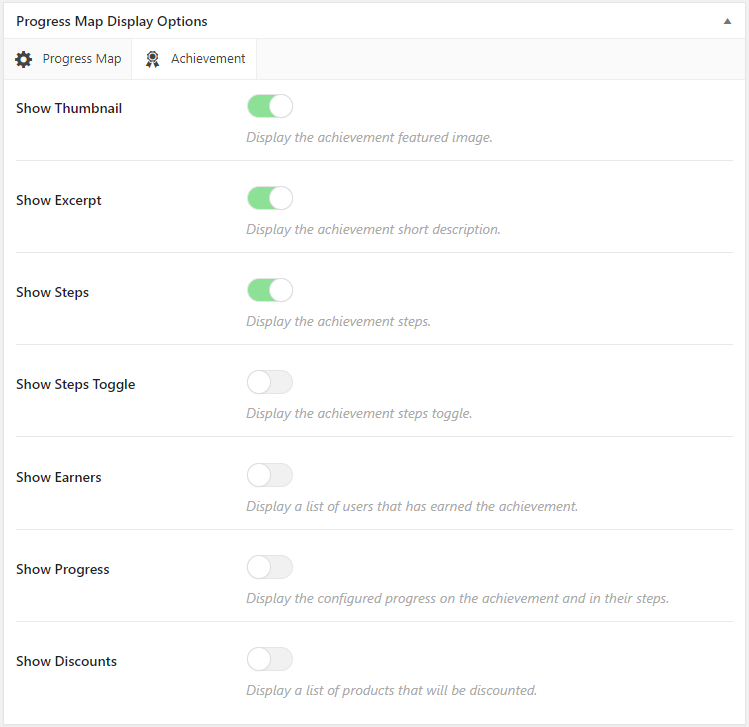 From the progress map settings page you can enable/disable the ability to access to a progress map as a page. If you disable it, progress maps has the [gamipress_progress_map] shortcode that allows you to place a progress map anywhere, including in-line on any page or post. 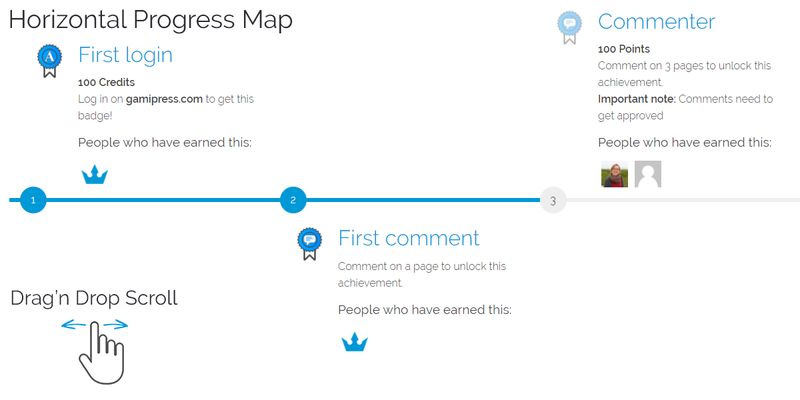 Also you can place any progress map on any sidebar through the GamiPress: Progress Map widget.